^Sure why not. Although the spring rates aren't THAT stiff. I would look into Fortune Auto or BC Racing with custom rates or you can go with Stance GR+. What camber, fender mods and wheel specs/offsets do you guys have to not rub up in front while drifting? i have tein flex ill trade you for something stiffer. passengers like the tein flex. they arent for drivers. they are just too soft. but i drift them regularly. you can drift the stock shocks if you wanted to its just how you want your car to feel while drifting. or you can just drill a hole through your ebrake handle with the button in and then stick a pin in it. i think i might be doing that soon though im more of a clutch kick guy and tend to forget about the ebrake. ^Thats actually a good idea! Imho If your a noob, any set of coilovers will work just fine and will be an improvement over stock suspension. I'm a noob at drifting, but my brother is pretty good at it(done a few competitions in S14 Silvia) so I'm going to get some lessons from him. Anyway, as far as setup, since mine is all-purpose car, meaning it will be handling daily driving, track, and drift(no competitions for me... just for fun), I'm wondering what I need to shoot for in terms of alignment. I'm thinking -2.5 camber front and -1.5 rear with 0 toe on both front and rear. I'm wondering if I should also add some spacers or not. I hear clearance issues, and since FIGS RCA offers +5 degrees of steering, I think my tierods will surely hit the LCA. Will +5 degrees of steering be enough? Will I have clearance issues like I'm guessing? idk, i figure a convenient solution that only costs $13 without any drilling or rigging is well worth it. ^have you installed the ebrake adapter? ^^^ The plate under the steering column. Run the harness through the large grommet at the corner of the firewall. Follow the OE harness to and under the stock ECU. You can squeeze the emanage connectors through all those grommets and it'll come out nice and clean. Just came back after a new alignment and wheel set up. Toe: 1 deg negative total in front, 4 deg positive total in rear. Ran 17X9 +15/+2 all day. 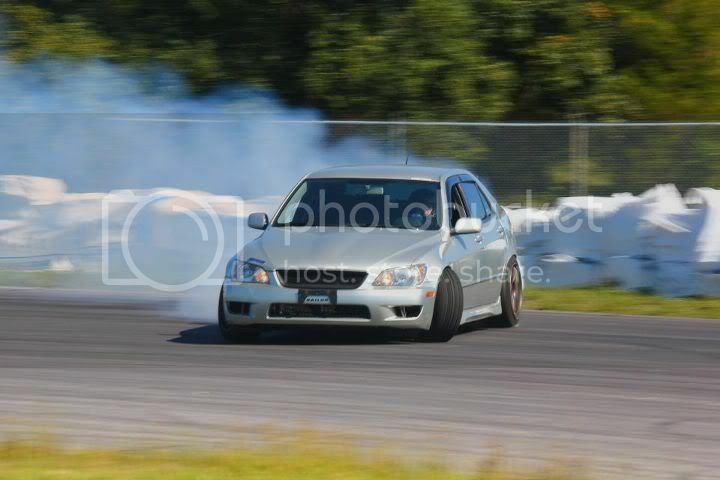 Felt like a solid grip set up but I actually enjoyed drifting it too! Closer to a neutral set up compared to my old one. This one was very predictable and moderately fast when sideways. What I'd like to see happen is a setup that will let me gain more speed through a corner while sideways. Suggestions? wider tires/ more grip will give you faster drifts. but you have to have the power to spin them faster also. ya i'm happy with the wheel and tire fitment i have right now, if possible i'd be looking for adjustments to my alignment.